For more than two decades Congresswoman Marge Roukema forged a reputation as a Republican moderate in the U.S. House, focusing on family issues and welfare reform. Personal tragedy helped prompt Roukema toward a career in politics and factored into one of her great legislative successes. 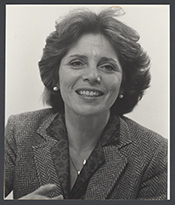 When she entered Congress in 1981, Roukema received assignments on the Committee on Education and Labor (later renamed Education and Workforce) and the Committee on Banking, Finance, and Urban Affairs (later renamed Financial Services). She sat on both committees for the duration of her career in the House, eventually rising to chair Financial Services’s two subcommittees: Housing and Community Opportunity, and Financial Institutions and Consumer Credit. In addition, Roukema worked on the Education Reform and the Employer–Employee Relations subcommittees of Education and Workforce. In the 98th Congress (1983–1985) she joined the newly formed Select Committee on Hunger as its Ranking Republican Member; she served there for a decade until the committee was disbanded in 1995. By the 107th Congress (2001–2003), Roukema was the Ranking Republican on the Financial Services Committee, but the Republican leadership skipped over her in picking the new chair. “The fact that I was a woman had something to do with it,” she told the New York Times. Her outspokenness and the fact that she did not raise prodigious amounts of money to steer to the campaigns of fellow House Republicans also contributed to the decision, she added. “I was an Independent voter in Congress, and I voted my conscience and my state,” Roukema recalled several years later. “That brought me down in [leadership’s] estimation. I was not elected to do what leadership [said]. I was elected to do what my intelligence, my conscience, and my constituents needed… . That was my reason for being in Congress.”10 She was offered a position as U.S. Treasurer in the George W. Bush administration in 2001 but turned down the offer to serve as chair of the Financial Services’ Housing and Community Opportunity Subcommittee. In November 2001, Roukema announced that she would not seek re–election to a 12th term. At the time of her retirement in January 2003, Roukema was the dean of her state delegation and the dean of the women Members. She returned to New Jersey where she served on the boards of several nonprofits dedicated to children’s issues and lectured about politics at several universities.11 Marge Roukema, who suffered from Alzheimer's Disease, died at the age of 85, on November 12, 2014, in Wyckoff, New Jersey. 1Melinda Henneberger, “Preaching Moderation on Her Own Side of the Aisle,” 20 July 1997, New York Times: Section 13NJ: 2. 2Raymond Hernandez, “Pushed to the Margins, She Stood Her Ground,” 6 January 2002, New York Times: Section 14NJ: 1. 5Karen Foerstel, Biographical Dictionary of Congressional Women (Westport, CT: Greenwood Press, 1999): 236. 6Bob Ivry, “Home from the House: Roukema in Transition after 11 Terms in Congress,” 1 December 2002, Bergen Record: A1; see also, Congressional Record, House, 103rd Cong., 1st sess. (3 February 1993): 405–407. 8Foerstel, Biographical Dictionary of Congressional Women: 236. 10Hernandez, “Pushed to the Margins, She Stood Her Ground”; Ivry, “Home from the House”; Jackie Kucinich, “Female GOP Committee Leaders Are a Rarity in the House: Some Point to Family Concerns, Need To Toe Party Line as Reasons Men Dominate,” 6 October 2005, The Hill: 30. 11Miles Benson, “Out of Congress, Not Down and Out; Members Depart With Pensions, Plethora of Perks,” New Orleans Times–Picayune, 19 December 2002: 7; Joseph P. Fried, “Spending Time at Home After Career in House,” 15 June 2003, New York Times: 23. Papers: In the Russell J. Mueller Papers, ca. 1971-1998, 26 linear feet. Persons represented include Marge Roukema. Papers: In the League of Women Voters of New Jersey Records, 1920-1991, 20 boxes. Persons represented include Marge Roukema. Sound Tape Reel: 1984, 1 commercial on 1 sound tape reel. The commercial was used during Marge Roukema's campaign for the 1984 U.S. congressional election in District 5 of New Jersey, Republican Party. Papers: In the Alan K. Simpson Office Files, ca. 1978-1990, amount unknown. Persons represented include Marge Roukema. "Margaret (Marge) Roukema" in Women in Congress, 1917-2006. Prepared under the direction of the Committee on House Adminsitration by the Office of History & Preservation, U.S. House of Representatives. Washington: Government Printing Office, 2006. Roukema, Marge. "Congress and Banking Reform I." In "Symposium: The Direction of New Jersey Banking." Seton Hall Legislative Journal 16 (1992): 481-90. Tomlinson, Barbara J. "Making Their Way: A Study of New Jersey Congresswomen, 1924-1994." Ph.D. diss., Rutgers, The State University of New Jersey - New Brunswick, 1996.